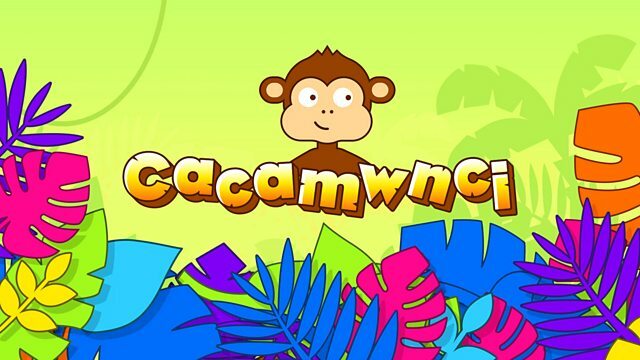 Mae Cacamwnci yn ôl gyda mwy o sgetsys dwl a doniol! Byddwch yn barod am lond bol o chwerthin! Join the crew for more funny and silly sketches! Be ready for a belly full of laughs! Browse content similar to Pennod 6. Check below for episodes and series from the same categories and more! -Here we are. Are you thirsty? -Meri Mew my cat is stuck! -Puss, puss, puss, puss, puss! -I feel much better already. -Can we go now, please? -the map and the compass. -One quick look at the map. -throw the twig into the water. -What will we do now? -but I've still got the compass. -Let's find a spot for a picnic. -There's a good spot that way. -This is a golf course! -Why did the sheep cross the road? -to keep the school neat and tidy. -Great. Ooh, one bottle left. -It's time to dance with Dai! -First, we have to warm up. -Has everyone warmed up? Great. -It's time to dance with Dai! Yeah! -Today, we're doing the statue dance. -the statue dance with Dai! -Served on a toilet seat. -in the garden centre today. -..such as behind the trees. -Is he hiding by the chickens? -There he is, in the big pot. -Pretending to be on a horse, sir. -on how to walk like a policeman. -Do it on your own then. -see what's in front of you. -Any excuse for a cake! -What will I have next? -Yellow jelly or red jelly? -There we are, John. Happy? -Do you want gel on your hair? -and a yellow gel to make it shine. -Susie, John wants gel for his hair. -Red, all over his hair. -Why? Jelly all over his hair? -OK, if that's what he wants. -Susie will put gel in your hair now. -Are you sure you want the red one?